ORANGE WALK, BELIZE -- The less-than-sonorous squawk of parrots woke me at dawn. Although the Hotel St Christopher is located on the edge of Orange Walk, a town about 65 miles northwest of Belize City, it sounded like we were on the edge of the jungle. Indeed, in Belize, the edge of town is the edge of the jungle. Belize boasts the highest percentage of protected land in the western hemisphere: almost half of its 8800 square miles is protected by the country’s network of national parks and nature reserves. Of a territory that is roughly the same size as Massachusetts, vast stretches of rainforest are virtually untouched by human hands. While tourism is the mainstay of the economy, the focus is on ecotourism, an attempt to use tourist dollars to preserve these natural resources. The idea is that small-scale, non-intrusive tourism adds value to wildlife conservation, while contributing directly to local communities. I was about to experience firsthand what ecotourism is all about. My wake-up call, I thought, was an auspicious start to the day. I had come to Belize in hopes of catching a glimpse of its national bird, the famous keel-billed toucan. We've all seen this big-beaked buzzard following his nose in search of breakfast cereal, but I wanted to spot the real deal, ramphastos sulfuratus, in his natural habitat in the wilds of the Belizean rainforest. Of course a parrot is not a toucan, but I thought the rowdy flock of green parakeets boded well for sightings of other exotic species. The setting for my search: the slow-moving New River, a lazy waterway winding through miles of Atlantic rainforest and teeming with wildlife. By all accounts, it was a birder's paradise. My guide: Orlando the ornithologist, so dubbed for his amazing ability to identify – down to the species, gender and age – just about every bird sighted along the river. Orlando claims an intimate knowledge of 98 species of tropical birds; in one day, we would see more than 30. My companions: Sharon, a professional bird trainer at an aviary in Salt Lake City, and her husband Michael. It was Sharon who spotted, within two minutes of our departure, the awkward northern jacana, strutting his stuff across the lily pads. Sharon explained that the bird’s disproportionately long toes allow it to walk on floating vegetation and to feast on the bugs and mollusks living there. I was impressed, both by the jacana and by Sharon's knowledge. “Yes, my wife is a bird-nerd,” Michael boasted. Our destination: Lamanai, a remote archeological site containing the ruins of hundreds of Mayan temples. Lamanai comes from the original Maya name, Lama’an ayin, meaning “submerged crocodile”. This name would prove appropriate. The 30-mile journey from Orange Walk to Lamanai normally takes about an hour, but our trip turned into a three-hour odyssey, as Orlando indulged his bird-loving clients. 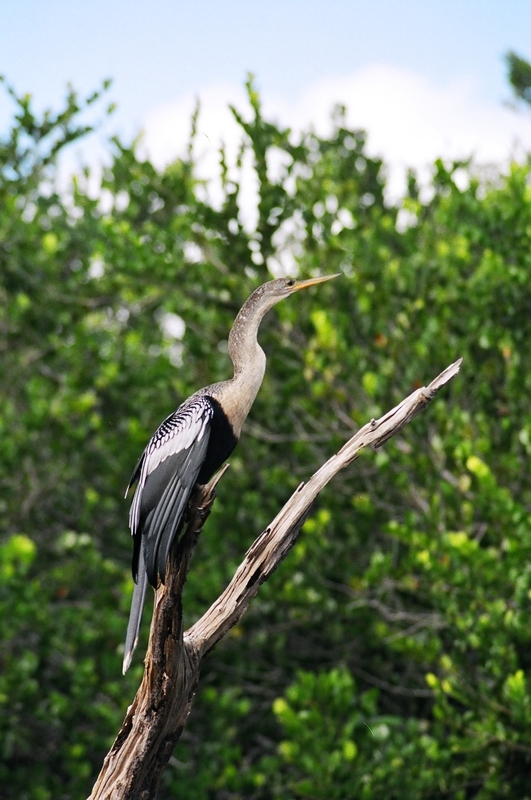 He steered the six-seat motorboat around the twists and turns of the jungle river, stopping to point out an elegant anhinga posed on the riverbank, its long neck curved in a graceful S. He spotted a coy grey-neck wood rail hiding amongst the reeds. Our boat drifted close enough for us to catch the shy guy's pink legs, yellow beak and blue-brown feathers on film. At one point, Orlando insisted that we keep our eyes on an overhang that was apparently void of fauna. Our boat floated within a few feet, and the tree’s bark erupted, as dozens of startled proboscis bats fluttered into our faces and dispersed. The only development along the river between Orange Walk and Lamanai is a Mennonite farm. A Germanic religious group that eschews modern conveniences and military service, the Mennonites found their way to Belize in 1958 (then British Honduras). Having come into conflict with governments in Mexico, Canada and several European countries, they were eager to settle in a place where they would be able to work the land and live out their conservative values, without outside interference. Belize turned out to be a good fit. Today, the 15,000 Mennonites in Belize constitute about 4% of the population, yet they produce almost half of the food consumed in this country. A lone man sat on the dock at the Mennonite settlement outside of Orange Walk. Dressed in overalls and a floppy hat, he could have been Pa Ingalls, straight from the Little House on the Prairie. He observed us as curiously as we observed him, while we slowly motored past. 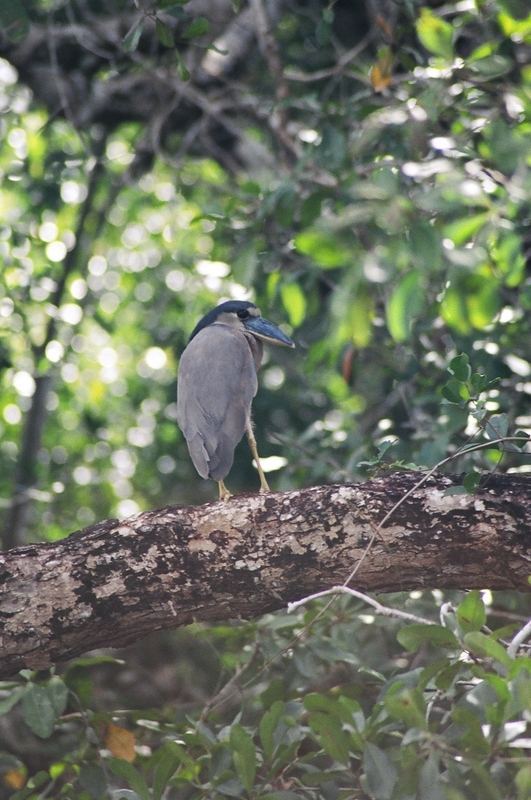 We spent several minutes idling, trying to get a good look at a boatbill heron. Bluish in color and squat in stature, he stood in stark contrast to his more elegant heron cousins. As Orlando finally allowed the boat to drift away, Michael gasped “A baby croc!” The young reptile was inches from our boat, camouflaged amongst the reeds and lilies, exposed only by his enormous eyeballs and spiny snout. 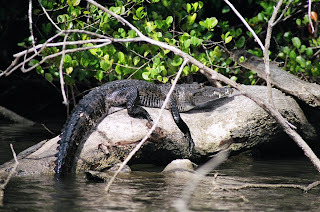 It was the “submerged crocodile” to which the Maya referred. This baby was too small to be scary, unlike the morelot crocodile we would see on our return trip, sitting on a log with his jaw stretched open wide, waiting to snap at any prey that came close. As we neared Lamanai, Orlando directed our attention to a tall palm tree that was about 100 yards inland. It was just possible to make out a massive nest in the upper branches. With the aid of binoculars, its resident was clearly visible: an enormous jabiru stork. With a wingspan up to eight feet, the jabiru is the largest flying bird in the western hemisphere. We finally arrived at Lamanai, which is a part of the Rio Bravo Conservation Area. 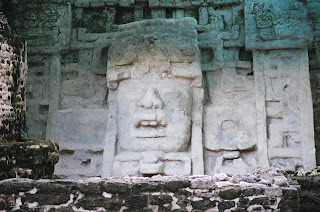 Archeologists believe that the site contains hundreds of Mayan temples, only a few of which have been excavated. Orlando explained that the area is normally flat lowlands; each mound we climbed was another temple, covered over by hundreds of years of growth. Largely unexcavated and surrounded by rain forest, Lamanai is an Indiana Jones movie waiting to happen. The temples – pyramid-shaped structures with no apparent interior – invite climbing and exploring and gazing over the treetops. A deep howl resounded in the air, making me think we had entered a haunted forest. I felt a shiver run down my spine, but Orlando just smiled. "Howler monkeys," he explained. Their namesake howl, audible for miles around, warns competing troops away from their territory. We could not see them, but they made their presence known. The howler, in fact, is the loudest land animal. We clambered over 100 feet to the top of the High Temple for a panoramic view of the New River Lagoon. When it was built in 100 BC, the High Temple was the tallest structure in the Mayan world. It might have been called the steep temple, I thought, as I stared straight down at Orlando, who was tiny at the base of the structure, and wondered how I would get down. We examined up-close a replica of Stela 9, a detailed stone carving of the Maya chief Lord Smoking Shell in all his royal regalia; we climbed the giant Jaguar Temple, named for the majestic symbol of Mayan royalty that inhabits the Belizean forests; and we posed in front of the magnificent Mask Temple, featuring a frightening, 13-foot, carved stone face, adorned with a headdress. Exhausted from our day of exploration, we sat on the lower steps of the Mask Temple, hoping for one last wildlife sighting -- a grand finale -- before we returned to Orange Walk. We could hear two howler monkeys sharing a feast in the treetops, but they were barely visible through the branches. Suddenly I noticed a rustle of leaves, a flash of black -- was the howlers? I stared at the dark figure, not a mammal but a bird, complete with vibrant yellow chest and Fruit Loop-colored beak. It was none other than the keel-billed toucan. He hopped around the heights of the mango tree, enjoying a late lunch with his mate. I waved over my travel companions. Sharon gazed through her binoculars, marveling at the toucans' rainbow of colors in the dark green canopy. "Look at you, gorgeous," she crooned, "frolicking in the wild, just as you are meant to." 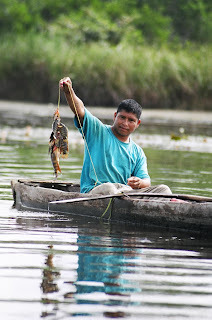 And that is what ecotourism is all about. American Airlines and US Airways fly to Belize City, from where buses run every hour to Orange Walk. Try to get on an express bus, or you may stop at every mile along the 65-mile journey. Make arrangements for your trip to Lamanai through the Hotel St. Christopher or Lamanai Outpost Lodge, or through an independent tour guide. Jungle River Tours (tel 011-501-302-2293, e-mail lamanaimayatour@btl.net) An excellent independent tour operator offering daytrips for $40-50 per person. Day trips depart from Orange Walk at 9:00 am. Hotel St. Christopher (tel 011-512-322-2420, 10 Main Street, Orange Walk) Clean rooms with private bathrooms are $40 for a double. The accommodation is basic, but the grounds abound with blooming trees and squawking parrots. The motel's setting on the banks of the New River allows tour boats to provide door-to-door service. Lamanai Outpost Lodge (tel 1-888-733-7864, http://www.lamanai.com/) Spend the night in the jungle, in style. Luxurious, thatch-roof cabanas are set amidst lush gardens on the New River Lagoon, just east of the archaeological site. The lodge offers excellent guided tours, including nighttime safaris, visits to the Mennonite settlement and wildlife canoe trips. Daily rates - including all meals, transfer to and from Belize City Airport, and guided tours - run $312 per person from May to November, and $450-512 per person from December to April. Daily rates decrease for longer stays. Originally published in the Boston Globe Travel, August 27, 2006. Orange Walk - The less-than-sonorous squawk of parrots woke me at dawn. Although the Hotel St Christopher is located on the edge of Orange Walk, a town about 65 miles northwest of Belize City, it sounded like we were on the edge of the jungle. Indeed, in Belize, the edge of town is the edge of the jungle. The setting for my search: the slow-moving New River, a lazy waterway winding through miles of Atlantic rainforest and teeming with wildlife. By all accounts, it was a birder's paradise. My guide: Orlando the ornithologist, so dubbed for his amazing ability to identify – down to the species, gender and age – just about every bird sighted along the river. Orlando claims an intimate knowledge of 98 species of tropical birds; in one day, we would see more than 30. We clambered over 100 feet to the top of the High Temple for a panoramic view of the New River Lagoon. 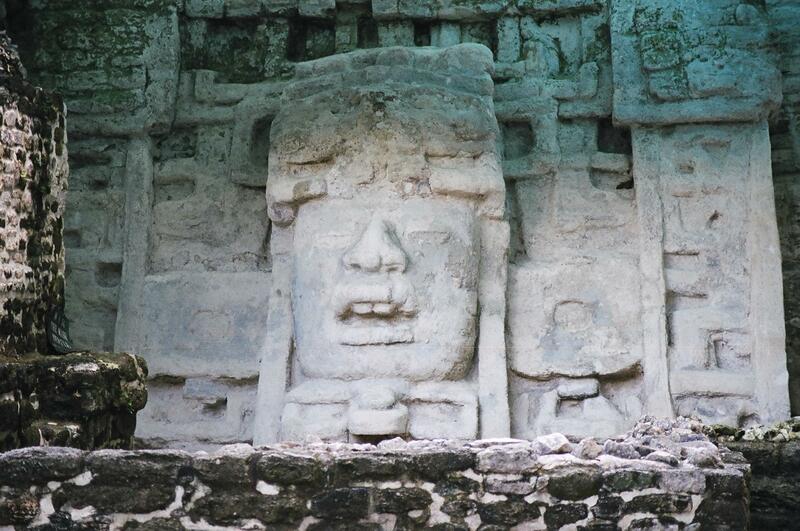 When it was built in 100 BC, the High Temple was the tallest structure in the Mayan world. It might have been called the steep temple, I thought, as I stared straight down at Orlando, who was tiny at the base of the structure, and wondered how I would get down. We examined up-close a replica of Stela 9, a detailed stone carving of the Maya chief Lord Smoking Shell in all his royal regalia; we climbed the giant Jaguar Temple, named for the majestic symbol of Mayan royalty that inhabits the Belizean forests; and we posed in front of the magnificent Mask Temple, featuring a frightening, 13-foot, carved stone face, adorned with a headdress. Unable to contain my excitement, I waved over my travel companions. Sharon gazed through her binoculars, marveling at the toucans' rainbow of colors in the dark green canopy. "Look at you, gorgeous," she crooned, "frolicking in the wild, just as you are meant to." 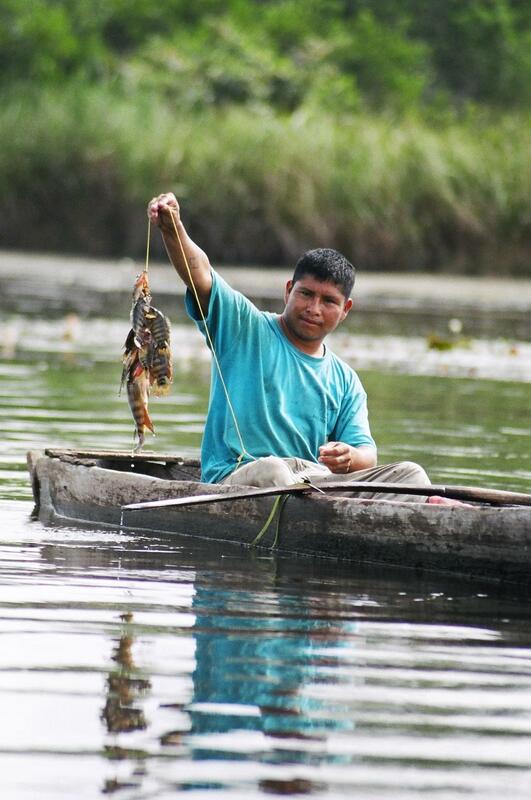 And that is what ecotourism is all about. Make arrangements for your trip to Lamanai through the Hotel St. Christopher or Lamanai Outpost Lodge, or through an independent tour guide. Jungle River Tours tel 011-501-302-2293 e-mail lamanaimayatour@btl.net An excellent independent tour operator offering daytrips for $40-50 per person. Day trips depart from Orange Walk at 9:00 am. Lamanai Outpost Lodge (tel 1-888-733-7864 www.lamanai.com) Spend the night in the jungle, in style. Luxurious, thatch-roof cabanas are set amidst lush gardens on the New River Lagoon, just east of the archaeological site. The lodge offers excellent guided tours, including nighttime safaris, visits to the Mennonite settlement and wildlife canoe trips. Daily rates - including all meals, transfer to and from Belize City Airport, and guided tours - run $312 per person from May to November, and $450-512 per person from December to April. Daily rates decrease for longer stays. Salvador de Bahia – As night falls on the Praça da Sé, enthusiastic crowds gather around street musicians and acrobats. Vendors call out to passers-by, peddling sweet coconut cookies and savory fried salgadinhos. Lovely ladies, clad in traditional white lace and huge hoop skirts, pose for photographers, while less alluring entrepreneurs hawk everything from cigars to CDs. I seek refuge from the touts by appearing preoccupied with the glorious view over the Bay of All Saints, namesake of the Brazilian region of Bahia. The sun is setting behind the island of Itaparica, casting an orangey glow over the bay. Beyond that lies the Recôncavo, the green, fertile lands that were home to the sugar and tobacco plantations that so defined this region. The plantations fueled the slave trade, bringing 3.6 million Africans to Brazil between 1550 and 1888. Today, Salvador – capital of Bahia – is known as the African soul of Brazil. This oldest part of Salvador is called the Pelourinho, or “whipping post”, named for the square where Africans were publicly flogged and sold into slavery. Nowadays, it is a place where Afro-Brazilian culture is celebrated: where drum beats have inspired Brazil’s greatest musicians; where Catholic saints intermingle with African deities. Bahians are famous for needing no excuse to make merry, and the narrow streets of the Pelourinho are packed with people year-round, especially on Tuesday nights. But Salvador is even more festive at holiday times. It is arguably Brazil’s hottest spot to celebrate Carnaval: the pre-Lenten fête attracts over two million revelers to dance and drink around the clock for a week straight. I am here for another rabblerousing street party, the Festa de São João. The two-day holiday is named for St John, but it is traditionally a harvest festival: celebrants dress up in farmers’ garb and dance to forró, Brazil’s upbeat version of country music. The streets are strewn with colorful banners and flags, while each square features a stage with gigantic speakers and rotating musical acts. I make my way over to one corner of the plaza, where a circle of men, all dressed in loose-fitting white, are banging on drums and chanting in sync. Two of them engage in a dance – or is it a fight? – in time with the music. The men’s graceful steps mirror each other, but they are punctuated by threatening kicks and spins and jumps. This form of martial arts, called capoeira, originated amongst African slaves as a form of self-defense. Banned by slave owners, the practice was set to music in attempt to disguise the fight as a dance. I join the edge of the circle and watch the two men joust for advantage. They jump from hands to feet, sending their limbs sailing within inches of their opponents. One contender hoists himself into a one-handed cartwheel, so his feet fly in the face of his rival. The crowd gasps, as his target ducks smoothly out of the way. These days, capoeira is part performance, part practice: the goal is to show your strength, but never to inflict harm. As I slip back into the crowd, I pause to admire one of the city’s many mural-covered walls. One vibrant painting depicts Oxalá, the Bahian god of creation, clad in flowing white garments and silver crown. 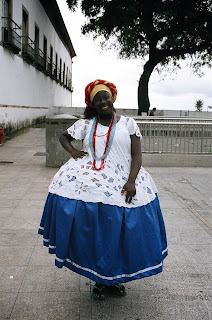 Nowhere is the influence of Africa more prominent than in the practices of Candomblé, the mysterious religion that the Yoruba people brought to Brazil from Nigeria and Benin. 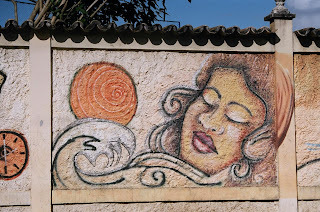 Oxalá is one of many Bahian deities, or orixás, each with a unique personality and sphere of influence. The faithful believe that everyone is protected by a particular orixá, much like a patron saint. They engage in female-centered rituals to honor their orixás, plying them with food and gifts, especially on festival days. Many Bahians practice both Candomblé and Catholicism, which may seem contradictory. But when slaves were forced to convert to Catholicism, they reconciled the two belief systems by acknowledging and celebrating the similarities between their orixás and the Catholic saints. So Omolú, god of plague and disease, is also known as St Lazarus; Yemanja, goddess of fertility, is likened to the Virgin Mary; and Oxalá, the supreme deity, is also called Nosso Senhor do Bonfim, or Jesus. As I examine the mural of Oxalá, a tout presses me to invest in a fita, or ribbon, which is a souvenir of Salvador’s most important church, the Igreja Nosso Senhor do Bonfim. My wrist is already adorned with a bright blue fita, which – tied with three knots – guarantees answers to three prayers. My fita is from the church itself, from the very steps that are washed during the annual Lavagem do Bonfim, a ritual presided jointly by Catholic priests and Candomblé priestesses. I wave the tout away. As the night grows darker, the drumbeats in the Pelourinho grow louder. I duck down an alley, where a crowd has gathered around the music makers. They are Didá, an all-female percussion band, hammering out rhythms guaranteed to make you move. They range in age from six to twenty-six. And they are gorgeous, with braids hanging down their backs, brown skin glistening with sweat, and ample hips swaying to the beat of their own drums. The sun has hardly set, and there is already dancing in the streets. Didá is playing axé music, a fusion of samba, reggae and funk that is defined by its heavy percussion and powerful rhythms. These are the same drumbeats that drive the Candomblé rituals, and the same drumbeats that set the pace for the dance of the capoeristas. Axé is edgy, energetic and purely Bahian. The music gained worldwide recognition when Paul Simon featured the local band Olodum on his aptly named album, Rhythm of Saints. Axé is an invention of the 1980s, but Bahia has long been the birthplace of Brazilian music. The country’s most famous songwriters – Gilberto Gil and Caetano Veloso – are both from Bahia. In the 1960s and 1970s, they were part of a movement that fused traditional instruments and rhythms with new international influences, revolutionizing the Brazilian sound. Before that, Bahian João Gilberto was the father of bossa nova. 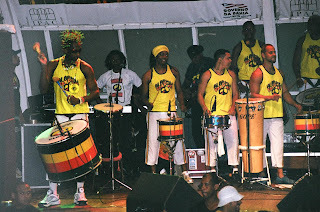 Even samba – the foundation of all Brazilian music – was born of black Bahians who had moved to Rio de Janeiro.